Pruning time & method: Pruning should be done during the growing season, spring through fall. Maintenance tips: Are sensitive to prolonged cold periods but will regrow when temperatures rise. Fertilize in early spring and again in early summer when plant is actively growing. Without pruning, will spread and become taller and shrubby. Do not disturb roots – root ball is loosely held together. 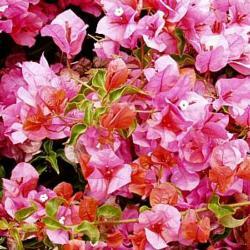 Bougainvilleas do not transplant well.